Donna Barney sits outside her Easton, Pa., home next to the bedazzled mailbox at the end of her driveway. Instead of waiting for the postman, however, she strikes a pose next to one of her personal creations. 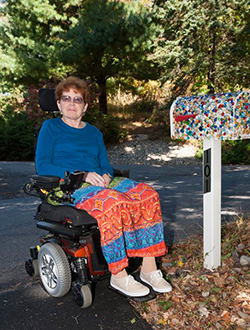 Adorned with different colored marbles, Donna's mailbox is not like others around her neighborhood, and it's all thanks to her artistic flair. "I just love doing artistic things," Donna said. "You can get the supplies you need from any crafts store, but it's all about the imagination and creativity you put into it." 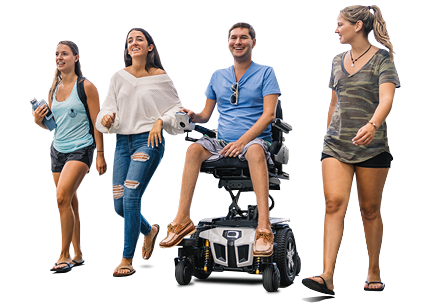 Donna, who has multiple sclerosis, uses a Q6 Edge® Power Chair with TRU-Balance® 3 Power Positioning Systems from Quantum Rehab® to get around more easily. Donna's Edge allows her to do things that she would otherwise be unable to do in her daily life. "This chair has been so great for so many reasons," Donna said. "I like being at home, but I also enjoy going out. With my Edge, there are plenty of things for me to do and see." For Donna, those things include going to the movies, church, and her favorite restaurants, often with her husband, Alan. Thanks to her Edge, she was also able to visit Dorney Park in Allentown, Pa., and ride the Talon, one of the park's famed roller coasters. "I can rely on this chair no matter where I go," Donna said. "It handles different kinds of terrain much better than my previous chair, and it's much sturdier." Donna enjoys her chair so much that she decided to give it a nickname: Slick. "When I first tried the chair out, I said, 'This is slick,'" Donna said. "I said that because of the way it drove, and the name just stuck." Alan also appreciates the functionality of the Q6 Edge. Previously, he had to assist Donna with her positioning, but he says the tilt option on the Edge makes it much easier for her. Donna and Alan, who have been married for 32 years, have a unique tradition: they celebrate their anniversary every month and keep track of the number of months they have been married. "The first one to say 'happy anniversary' each time gets bragging rights," Donna said. "On anniversary days, we like to go out to dinner, talk about our marriage, and reflect on our time together." Donna and Alan have three grown children: Linda, Douglas, and Janis. In their spare time, the two enjoy entertaining guests at their house. "We used to have a happy hour every Friday," Donna said. "Alan even held his annual high school reunion at our house." When they're not socializing, Donna and Alan do their part to help the community. They support the Multiple Sclerosis Society, and Donna has donated some of her jigsaw puzzles to a local senior center. She says there is great reward in helping others. "I love doing puzzles, and I have plenty of them to share," Donna said. "I know it makes the seniors happy, so doing it makes me happy, too."